Strength is such a loaded idea. What is it to be strong? We always think of it as a great character trait. Strength of mind, strength of body, strength to bear pain, strength to hide your feelings. You hear these stories in eulogies of how wonderfully strong the dead were. No one says, they were vulnerable and hurt and needing support. Instead we champion the stoic. Go into the night with your head held high. Why is this so laudable? Why not go into the night kicking and screaming and holding out your hand clinging to love and looking to be buffered from the fear? Because it hurts the ones around you. It burdens those who love you. It is scary to show your pain. It is even scarier for those who love you to see it. Both sides end up feigning strength. Shoring up their walls to hide their terror. It contains it supposedly. I saw this woman. And after about half an hour she was able to cry. She said to me, “oh, that feels so good. I have not cried in years and all I really wanted to do is cry.” I told her that I had a very positive attitude towards crying, and I thanked her for being able to feel safe enough to do that in front of me. I wanted to talk to her about what it meant to be strong, since this was the word that was pervasive. I said, what is the strongest tree? In your mind is it a redwood? Giant and immovable? Or stop and think for a minute about a palm tree, slim and flexible. Delicate almost in appearance. 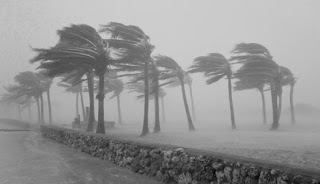 When hurricane force winds blow who is left standing? It is not the old giant tree with its rigid trunk and unyielding branches. It is the palm tree, bending over to impossible angles, washed over by the force of the attack, accepting of the onslaught, that will survive. These are trees that were born to withstand trauma. To me strength is feeling. Strength is reaching out and admitting that that you are hurting and being able to accept help. Strength is being able to see your loved ones in pain and allowing them let go and bend with the wind, while understanding that it will not break them. Strength is not about building an impenetrable wall over which nothing gets in or out. Strength is about resilience and showing your pain and knowing that it will flow over you like a hurricane. It’s true, some storms are too strong and we can become uprooted, but if our very design is to bend and flow with the wind, most of our storms will pass over us making us stronger and ready for the next one. So I dedicate this blog to the sufferers. I get angry sometimes with the rhetoric of fighting and strength that comes with cancer. It puts this onus on the ill. It makes them feel like they are failures when they look at their fear and their sadness. It makes them feel responsible when they have no energy to get up and fight. I say to them that your strength is in your reaching out your hand and saying, I am scared, I am lonely, I need your help. Your strength is in bending, and coming close to the ground where we can touch you. This entry was posted in Bereavement and Loss, Coping Skills on September 5, 2013 by phreshmaker2.